One of the dangers that often goes unrecognized in the church today is the problem of the tyranny of the weaker brother. On Wednesday afternoon at our pastors conference, Dr. R.C. 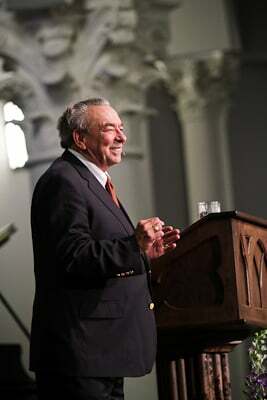 Sproul gave a timely lecture on the subject. His main text was Romans 14. The Protestant Reformers were united in their affirmation that the Bible teaches justification by faith alone but not by a faith that is alone. Saving faith immediately, necessarily, and inevitably shows evidence of itself in the good works we produce in the process of sanctification. Paul tells us to work out salvation in fear and trembling, as God works in us to will and do (Phil. 2:12–13). We are not to be at ease in Zion or quietists that let go and let God. The whole Christian life requires labor with the godly fear that we call reverence and with the adoration that is ever present in the hearts of those who tremble before the living God. Sanctification is not to be undertaken in a casual matter. One of Roman Catholicism’s fears during the Protestant Reformation was that the doctrine of justification by faith alone would produce antinomianism. There were indeed some radical reformers who misunderstood the doctrine and moved in that direction. But the Reformed wing of the Reformation was convinced that though the ceremonial law had been fulfilled and abrogated, the moral laws rooted in God’s character are still relevant for showing Christians how to please God, not for the earning of salvation. Today, antinomianism is epidemic. Some say the Old Testament law has no further import to the life of the Christian. One of the most prevalent examples of this idea is the destructive epidemic of the carnal Christian. This is a contradiction in terms once we understand what is meant by the words carnal Christian, but there is a sense in which it has some application to us. All of us who are in Christ remain carnal to some degree because our flesh — the will and nature in opposition to God — is not eradicated until we are glorified. This is not, however, what advocates of carnal Christianity mean in calling some believers carnal. The idea of the carnal Christian says it is possible to come to true saving faith and receive Jesus as Savior but not as Lord. A truly converted person may never produce the fruit of a sanctified life but may remain utterly carnal and unconcerned with God’s law unto death. Christ is in the life of the carnal Christian, but He is not on the throne of the person’s life. The self sits on the throne and determines how one will live. Where does this idea of carnal Christianity come from? Bad theology is one answer. But it may also originate as a way to explain why so many profess Christ and yet show no evidence of it. I knew a young man who lived with his girlfriend and sold drugs, but he excused his sin by calling himself a carnal Christian. He went forward at an altar call but made no effort to follow Jesus. He is an example of antinomianism with a vengeance. The other main threat to our sanctification is legalism. What is legalism? It is not an easy question to answer because there is not one monolithic form of legalism. The worst legalism says that by our works we can satisfy the demands of God’s law and gain salvation through our good deeds. This is the view of salvation held by all people who do not affirm biblical Christianity. But if this were truly the way of salvation, it could only cause us everlasting doom, for no one fulfills the law perfectly. Other forms of legalism were perfected by the Pharisees. The Pharisees majored in the minors. This form of legalism gives great attention to minor matters of the law at the expense of the weightier matters of the law. Jesus castigated the Pharisees for only observing the tithe. People should tithe, he said, but not at the expense of other matters. We cannot pick and choose which commandments to follow (Matt. 23:23–24). We all know people who are scrupulous about some minor things but do not care whether they display the fruit of the Spirit (Gal. 5:22–24). The Pharisees also violated the spirit of the law to get around the law about traveling on the Sabbath day. Let’s say they calculated journey to be about a mile, which should have meant that they would not travel more than a mile away from their home on the Sabbath day. They created a loophole, however, that said a home could be established if they left a personal item like a toothbrush somewhere. If they wanted to take a journey on the Sabbath that was fifteen miles, for example, they could leave a toothbrush or other personal item every mile along their desired route. That way, they would never travel more than a mile from their home. Starting from their real house, they would get to the place where they left their first personal item after traveling only a mile. They were at their new “house” when they found their toothbrush and everything started over again. They could then travel another mile to their next house, then the next house, all the way until their final destination. One of the most destructive forms of legalism then and now, and the one most seriously practiced by the Pharisees was their tendency to add to the law of God. They bound men’s consciences where God had left them free to do what they wanted to do. This problem has plagued the church for centuries. In any case, it can be helpful to ask ourselves where we fall on this wide spectrum of legalism and the atmosphere we have in our church. Connected to the matter of legalism and antinomianism is the idea of adiaphora and Christian liberty. Adiaphora are matters indifferent — those areas where one is commanded neither to do or to abstain, areas where God has not told us what or what not to do. Christians have liberty in matters indifferent; we can choose for ourselves what course of action we will take. Christian liberty never gives us the liberty to disobey God. It is not a disguise for licentiousness. Once I had a teaching opportunity for a mission in a community outside of New York City. After the mission ended, I was invited back to the home of one of the mission leaders for a prayer meeting with the mission’s leadership team. To my horror, people started to pray to their deceased relatives when the meeting started. I interrupted them and told them that Christians are not allowed to pray to the dead because it is forbidden in Scripture and is a capital offense in the Old Testament. The mission’s leaders responded that the rule did not matter because it was an Old Testament rule. I asked them what had happened in redemptive history that would make a formerly abhorrent practice acceptable to God. They responded that they were not under the law, and that I shouldn’t lay a guilt trip on them. This exchange reflected a serious misunderstanding of Christian liberty on their part. Consulting witches and so forth is not adiaphora. Clearly, occultic matters are not matters indifferent, and there is no biblical reason to think otherwise. On some occasions, however, we cannot agree on what is indifferent. The real, biblical concept of Christian liberty helps us coexist when we do not have the same understanding of what fits into the category of adiaphora. Where does our Christian liberty begin and end? This has been a problem in the church for ages. In the body of Christ at Rome, there were some who ate meat and some who ate only vegetables, and the two groups did not agree on what was best (Rom. 14). Paul’s response is that since God has not set forth a specific law in this case, neither group should judge the other. The vegetarian and meat-eater both belong to Christ, so how dare we judge one another. How dare we judge Christ’s fellow servants where God does not judge them. We must evaluate others only according to the explicit standards of Scripture, not those invented by human traditions. Fifty years ago, evangelicalism was plagued by a legalism that said you don’t dance, drink, smoke, go to movies, play cards and so forth. Though things have improved on this front, this was such a matter for many evangelicals that one’s entire spirituality and Christian profession was to be judged by conformity to these stipulations. But you cannot find any explicit laws about these things in Scripture. As an example of this legalism, I remember an occasion on which a woman took several of us out for dinner. We were all Christians, and when the waitress showed up to take our drink order, our hostess immediately chimed in and told the waitress that nobody would be drinking alcohol since we were Christians and Christians do not drink alcoholic beverages. I was embarrassed for that waitress, for she had been rebuked and because her idea of a Christian was now that a Christian is someone who would never take a strong drink. But Paul said the kingdom is not a matter of eating and drinking. How many Christians have been taught that it is sinful to do things that God has not declared sinful? They have been told that some matters indifferent are actually not indifferent. Here is the basic issue. If I believe it is a sin to drink alcohol and I drink alcohol, then I have committed a sin. This is not because it is sin itself to drink alcohol but because it is wrong to consciously do what we consider to be a sin. In willingly acting to break what we think is God’s law, we show forth a rebellious Spirit. We must therefore be careful when it comes to judging the behavior of others on matters indifferent because we are not all at the same level of understanding. In Corinth, some Christians were troubled by buying meat that had been offered to idols even though it was being sold as meat, and this caused friction in the community. Paul said it was meat, and so it was not wrong in itself to consume it if one was buying it later and not taking part in the idol worship (1 Cor. 8). Those who wanted to avoid the meat entirely were acting as secondary separatists. Not only were they refusing to eat the meat offered to idols (primary separation), they were refusing to associate themselves with those who did eat the meat that had been offered to idols. Of course, to be consistent, secondary separatists would have to remove themselves from the planet, for everyone we know and everything we do can be connected with something we have scruples against or something that is sinful in some way. How do you deal with the weaker brothers? Do you laugh at them? Jump on them with criticism? Or, do you respect their consciences and say, “I know you have this scruple, and I don’t want to make you stumble and entice you to do something that you are convinced is the violation of the law of God”? This is what Paul was willing to do (1 Cor. 8:9–13). Paul was willing to give up meat altogether for the sake of his weaker brother. If a person has a scruple I do not share and it is a scruple unto the Lord, then I have to bend over backwards to be caring and not flaunt my liberty in their face. I should do the act that is indifferent but offends another believer in private. Our freedom in Christ is not an autonomy whereby we can do anything we feel like doing. It must always be accompanied by a charitable sensitivity toward those who have scruples. But what happens when weaker brothers want to elevate their personal scruples to a level of a moral standard for Christianity or when they want to require it of all those who want to be members or officers in the church? Here the weaker brother becomes the legislative brother and begins to take a personal scruple and bind the consciences of people, destroying Christian liberty. The question is what do you do and how do you discern the identity of the weaker brother? We have to be very sure that the standards we impose on others in the church are biblical standards and not our own scruples. Some ministers have required their elders to sign a pledge never to consume alcohol for any reason, even wine. But this would violate the qualifications of Paul and Jesus, who both drank the beverage. The same minister will say that they can make the rule because first-century wine was not alcoholic, but that is a false assumption. Jesus was not called a wine-bibber (Matt. 11:19) because he drank Welch’s grape juice. To assert that first-century wine was not alcoholic is the imposition of an American cultural norm out of a desperation to maintain a non-biblical position on alcohol. There is no doubt a vehement prohibition of drunkenness in Scripture, but not a condemnation of the proper consumption of alcohol. Paul was willing to adapt his behavior to the scruples of weaker brethren when they did not impose them on others. The example of Titus’ circumcision in Galatians 2:1–10, however, shows us that as soon as the weaker brother tried to enforce his weakness as the law of the church, the gospel was threatened. Rather than deny his own Christian liberty in this case for the sake of the weaker brother, Paul fought tooth and nail for the gospel. Once a person with a scruple tries to make his scruple the rule of the church, then he must not allowed to enforce a law where God has set us free. These principles of matters indifferent and the stronger and weaker brother are easy to grasp, but applying them takes a lot of wisdom. We must apply the gospel wisely and in love so that we might be patient with those young in the faith, but at the same time we cannot let the weaker brother impose his view on others. Do we impose rules and regulations in our churches where God has left us free? We must be careful not to do this for the sake of Christ and His little ones.